This new mask gives you a bigger effect. Incuding a mask with an adjustable rubber band, a reservoir (3 parts) for the cotton pad with the liquid. 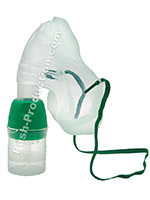 A flexible tube is included to connect it to an oxygen therapy or aerosol therapy device (optional). Push Xtreme Fetish - Double Inhal..
Push Steel Amulet - Golden Deluxe..